When you need supplemental or recreational oxygen in Telluride, Oxygen Delivers, the original local oxygen concentrator store is absolutely ready to help. 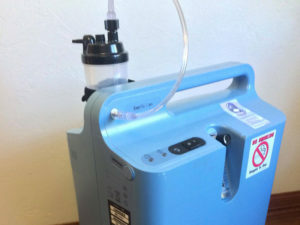 Whether you’re looking for a portable concentrator to go out and enjoy the area or a stationary (for home or lodging) concentrator, we’ve got the oxygen machine to suit your needs. We do have additional oxygen supplies if you prefer something other than a concentrator, but the concentrators are our specialty and we deliver directly to your home or place of lodging. If you already know which type of oxygen machine you want, give us a call now at (970) 728-7279 to reserve your concentrator. If you’re not sure, read on to see which type of concentrator is best for you. The home or stationary concentrator is our most popular rental. If you’re wanting to relax at home or other accommodations while benefiting from and endless supply of oxygen, the stationary concentrator is what you’re looking for. It has wheels so you can easily move it from one place to another, and a continuous flow of oxygen which one or more people can use at the same time. It comes with 2 nose cannulas, complete with tubing, and you can order extras if you think you’ll need more. It’s very simple to use. We’ve included instructional videos and a complete safety and set up guide on the Oxygen Delivers site to make sure there are no question unanswered. Simply CLICK the button below for instructions. The Respironics EverFlo is the main type of stationary concentrator we keep on hand. We keep a large supply of stationary concentrators in stock so we can make sure they’re available for you when you need one. If you’re not going to need a concentrator to go out and about, the home concentrator is what you’re looking for and the Respironics EverFlo is the model most readily available. Call us to reserve your oxygen concentrator now or continue reading to learn about portable concentrators. Whether you’re looking for an oxygen generator to get that extra boost of oxygen on an alpine adventure in Telluride or simply for EASY toting while walking about or doing regular activities, a portable oxygen concentrator will serve you best. Our portable machines are lightweight and easy to carry allowing you to do what you want to do; knowing you’ll be getting the oxygen therapy you need while you’re doing it. Portable concentrators deliver oxygen by pulse dose or continuous flow and some models have settings for both. Pulse dose concentrators deliver oxygen when you breathe in and rest when you breathe out, allowing for longer battery life. Continuous flow concentrators deliver a steady flow of oxygen, just like stationary concentrators do, the main differences being they are portable and they use batteries instead of an electrical outlet as a power source. With the continuous flow setting you get a higher saturation of oxygen than pulse dose, but the battery life is much shorter and more oxygen is wasted because it’s producing oxygen constantly instead of only when you breathe in. Whether your portable concentrator is pulse dose or continuous flow, you never have to worry about running out of oxygen like you do with an oxygen tank, but you do have a limited battery supply so it’s important to know how long your battery life is, which we’ll go over in a minute. We may have the above portable concentrators for rent in limited supply but the Respironics EverGo is Oxygen Delivers’s most popular portable concentrator rental which we’re most likely to have AVAILABLE. The EveGo weighs 8.5 pounds with 1 battery or 10 pounds with 2 batteries and has a battery life of up to 4 hours per battery. This long battery life allows you to get out and stay out for a long time if you want to. The batteries take about 2-3 hours to charge from completely drained to 100% full, and can be charged with a vehicle charger or regular outlet. You can also use the concentrator when it’s being charged. The EverGo oxygen concentrator is also compact at only 6 inches, by 12 inches, by 8.5 inches. When you’re wanting to get out or move about our EverGo pulse dose oxygen concentrators give you the freedom to do what you want for extended periods of time, while getting the supplemental oxygen you need to enjoy that time.